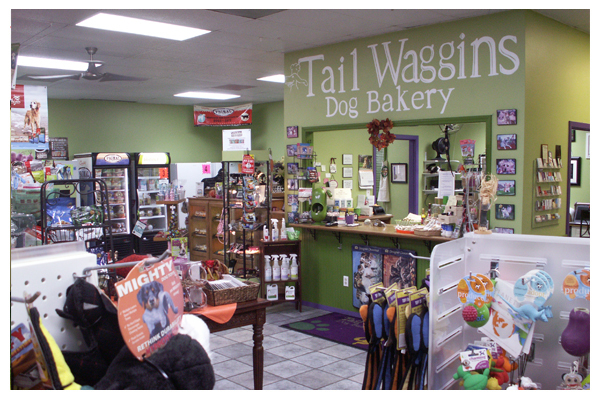 You will find a generous variety of specialty cookies at Tail Waggins. Along with our full operational, onsite bakery, we offer Premium Foods, Raw Foods, Gifts, Cats Foods and Supplies, Full Service Grooming and our Luxury Dog Wash Spa. Our Self Service Dog Spa will surpass all your expectations. Our elevated Marble lined tubs make washing your dog so easy. We supply everything you need. Bring them in dirty, take them home, we clean up the mess. Tail Waggins Dog Bakery is near and dear to my heart. That’s why I take the utmost care and hours of research to provide our customers with, what I feel are the best products on the market. I pride myself in only selecting the best ingredients for the treats we produce and you will be able to identify every ingredient in the list and we do not cut corners. Our treats are a little more expensive, but you can be certain, you are getting a quality, wholesome product for your dollars. Some goes for the foods that I choose to have in my store. We pride ourselves in bringing you the latest information on the foods that we carry. We will encourage you to feed your pet a whole prey diet as they would eat in the wild. We will provide you the education and follow up you need to make this transition and see your pet thrive. Our list of treats is endless, including our bakery goods, so it is best to come in and browse our huge selection. We only offer USA made treats, so feel comfortable with shopping with us. We encourage you to bring your leashed pets with you so they can pick out their favorites.